For twenty hours straight, ultramartathoner Dr. Joan Steidinger ran and hiked through Nepali Hymalayas, braving harsh weather, rugged terrain and high altitudes. She was participating in the Action Asia Nepal stage race, and annual 100K event. The experience was rewarding, to say the least, but what really touched the Mill Valley resident and her husband, JP Poulson, was their work with the Freedom Children’s Welfare Center, a small orphanage in Kathmandu. “It was so touching to see how strong these children were, and wonderful to know that we could help make a difference in their lives,” Steidinger explains. The concept was simple: attend a sport psychology conference in Hawaii then travel to Nepal and run a three day stage race to raise funds for a small Nepali orphanage. Not being given much information about the race in the Langtang Valley region, the Nepal race was destined to become a major adventure. The orphanage in Kathmandu was to become a major delight. 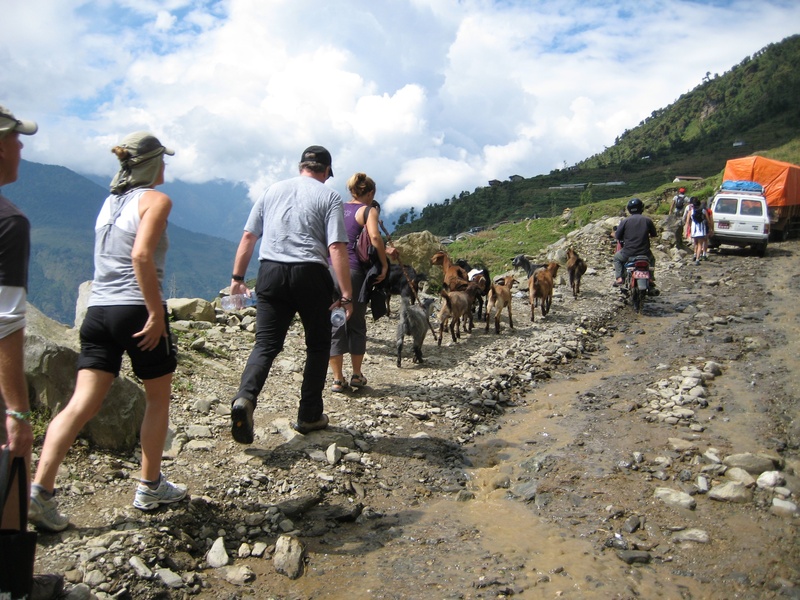 In September of 2010, my husband, JP, and I went trekking in Nepal. While we were there we met Pancha, who is the chair of the board of directors at the Freedom Children’s Welfare Center, a small orphanage located on the outskirts of Kathmandu. JP and I instantly wanted to do something to help the center, and when I heard about the Action Asia Nepal stage race, it seemed like the perfect opportunity. The Freedom Children’s Welfare Center houses 26 children between the ages of five and eighteen; many of these older children never get adopted. Visiting the orphanage is both heart rendering and breaking, and many of the childrens’ stories truly touched us. Take Angyil, for example. A friendly and outgoing five year old with short brown hair and a wide smile, his father deserted him and his mother shortly after his birth. For a brief while, he was raised in the loving arms of his petite, brown eyed mother, but she became suddenly ill and passed away when Angyil was only one and a half. Thankfully, Pancha took Angyil in immediately, and he was the child greeting committee when we arrived at the white, three story stucco orphanage. It felt good to know that we could help raise money for these children through the Action Asia Nepal stage race. Taking place in the high altitude and rugged terrain of the Himalyayas, the event is meant for experienced ultrarunners and fast hikers. With my solid training schedule of multiple trail marathons, two 50Ks, and longer runs in between, I felt ready to go. Although difficult, the race was full of rewarding moments. One part of the race, for example, contained three climbs; the first two went from 5,000 to 7500 feet and back down, and the third went from 5,000 to 10,000 feet. They were extremely challenging, but reaching the top of the third climb was so exhilarating. The view, which allowed us to look at the surrounding verdant forest of the Himalaya, was spectacular. The day following the race, we went back to the Freedom Children’s Welfare Center. We were greeted by the caretaker, Kamala, and Angyil and received a tour of the three story facility. We especially enjoyed watching the children play and fly kites on the roof. We also brought several boxes of books and stationary materials, and it was fun to watch the kids dive into the books, each selecting several; Angyil even brought his over to show me. In addition, we presented the orphanage with enough money to fund the educational costs for all 26 kids for a year. Getting over 100 people from all around the world into small mustard yellow, cherry red, and royal blue busses to drive to the location of the race proved to be a challenge in itself. On the drive, we encountered the smallest, most dangerous road we’ve ever been on in a bus, landslides included. The race itself was naturally a challenge, with rocky, unstable terrain, cold temperatures, and twenty hours of running and hiking. ultrarunners or fast hikers, so you must be willing to undertake a rigorous training schedule. Even if you’re not up for that, you can still help the Freedom Children’s Welfare Center through donations – they are always in need of school supplies, such as pens, paper, and note pads. To learn more about Dr. Joan Steidinger, visit her website here. This entry was posted in Helping kids and tagged Action Asia Nepal stage race, Dr. Joan Steidinger, Freedom Children’s Welfare Center, Freedom Children’s Welfare Center nepal, Joan Steidinger, JP Poulson, nepal, Nepali Hymalayas. Bookmark the permalink.